Part of my process in writing this thing is to finish by reading it back to myself as though I knew nothing about the subject at hand, as it does me no good whatsoever to present this newsletter if a reader can’t easily comprehend what has shaped my thinking. And to be honest, I think I have missed the target with this one. This piece is WAY too wordy, and there are entire sections which I fear are murky and difficult to follow…but I think the move in Bonds is “immediately imminent” and I don’t have the time or energy to go back and do a full re-write…So it goes out “as is”. As always I appreciate if you can muddle your way through it all. I know that WHAT I am recommending is quite clear, but WHY might not be. Really…go find me anybody who is now looking for a decline in interest rates and a rally in the Bond market. I know there must be a few out there but I haven’t seen them. So now, what has been probably the most anticipated event (for MONTHS) I have ever seen in the markets has become a reality…and from a trading standpoint, I would suggest that every trader, investor and speculator who would EVER short Bonds (based on this misplaced idea that tapering is bearish for bonds) has already done so…that since, from their standpoint, tapering means falling bond prices is a foregone conclusion, why wouldn’t they all be short? Or why would there be anybody left to get short? Which IS the case…Per Commitments of Traders reports, Small Speculators (forever caught on the wrong side of the markets), recently held their largest short position in 10 Year Note Futures since 2006. Without going into detail (this newsletter is already going to be way too long), I’m just going to say, “Everybody is already short and all but certain they are going to make money. They are going to lose and I think they are going to lose big”. It absolutely does not mean I will be right, but I am now probably more rip roaringly bullish about Bonds than I have been in years…Frankly, I believe we have already started the move up, and having seen 30 years of intermittent bull stages begin in the Treasury Bond market, I am fully aware this market could easily be 5-7 points higher ($5k-$7K per futures contract) within a matter of weeks…and beyond that, on its way to being 15-20 points higher ($15k-$20K per futures contract) over the next 4-6 months. 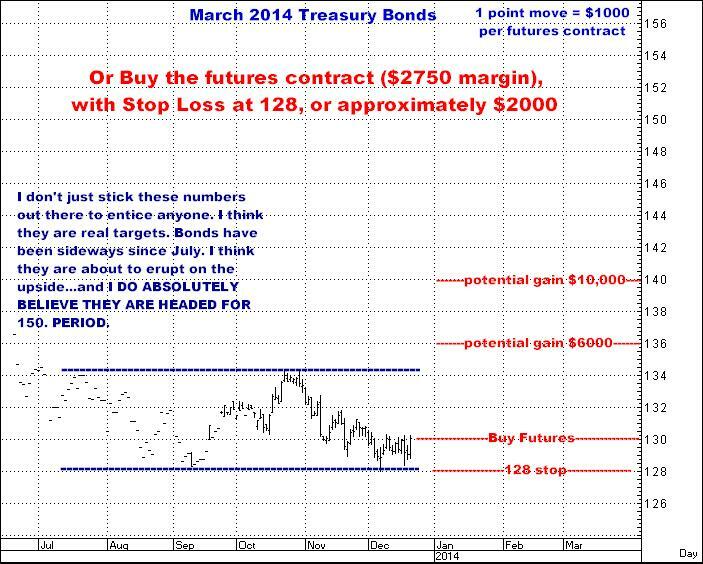 I am still buying Treasuries. The market is currently at 130. I see it having as having an honest shot at 150 by mid-2014. Again, it does not mean I will be right, but for years I have said the Bond market is the market I understand better than any other…By that I don’t mean that I know every little statistical detail about how these debt instruments work, but that, for various reasons, I do understand what actually MOVES this market, HOW it moves and WHY it moves, all of which I am quite comfortable in saying, are not EVER for any of the reasons generally harped on by the sheep in the media. My experience has been that most of the talking head claptrap you hear, always so “logically” presented, is generally NOT relevant to what direction any market is going, and in the interest rate market, which I have long considered to be, above all others, THE CONTRARY OPINION MARKET, is where all those guys are perennially more wrong than in any market we trade. Any of you have read MY claptrap for years will know that I could fill up 50 pages with Treasury Bond commentary, but it’s a Saturday, it’s Christmas, and I want to get this out today…so here is my usual, “I will try to be brief”. I think long term rates are going to be staying “low” for some years to come. Long term rates are NOT going up any time soon. BELIEVE ME. There is no law that says, “Rates are low. They have to go up”. They CAN stay here for years to come. Think about this…The USA and world economies have basically been in an enormous expansion for the past 30 years. Our stock market has gone up 2100%. Interest rates have dropped from 15-20% down to 1-3%. The Fed has been through innumerable versions of “easing”, the most recent being QE’s 1, 2, and 3, and for all of those 3 decades, with EVERY instance of those eases, I have heard the ever-wrong battle cry, “They are pumping too much money into the system! Hyperinflation is coming! Sell Bonds! Rates are going up!”. 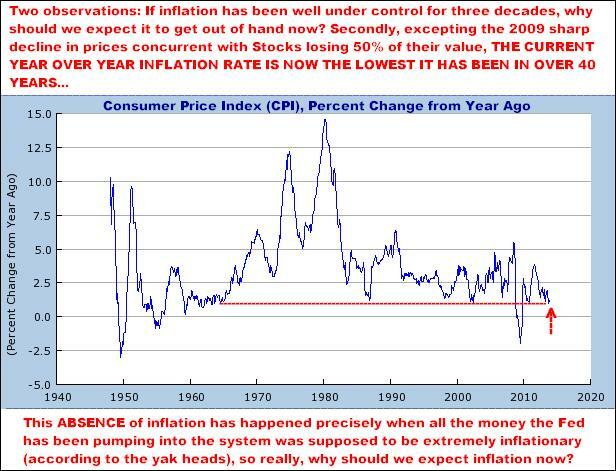 But the bottom line is this: IN SPITE OF ALL THOSE “PRO’S” CALLING FOR HIGH INFLATION TO APPEAR FOR OVER 30 YEARS NOW, IT HAS YET TO ARRIVE…AND IF THE WORLDWIDE EXPANSION/BOOM WE’VE LONG BEEN IN HASN’T RESULTED IN INFLATION, WHY SHOULD WE SEE IT NOW? Really, when you get down to it, since 1990 when both the ex-Soviet Union and China began climbing on board the capitalist wagon, bringing several billion consumers (and their demand) into the marketplace, if we were going to ever see prices “getting out of hand”, I really think we should have seen it by now. And we haven’t…and in my opinion, WON’T. And just to clarify the relationship between Bonds and Inflation…If, for example, you buy a bond that pays you 3.5% for the next 20 years, and inflation roars up to 7%, and is expected to stay at those levels, your 3.5% yield is actually losing you 3.5% each year that inflation remains elevated. 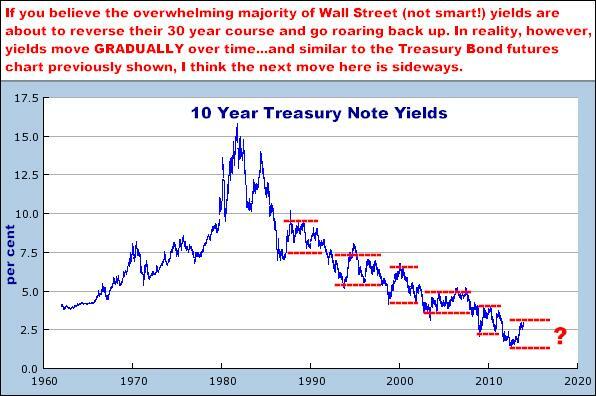 In this case, no one is likely to want to buy bonds paying only 3.5%, and this is when you would expect to see bond prices falling, and yields going up, to the point where they pay an interest rate that at least beats the inflation rate…This, in a nutshell, IS the “reason” all those inflation mongers have been wrongly warning you about the impending “spike up” in rates for all these years…That is, they’ve been supposing inflation is coming and bond yields will HAVE to go up to account for a higher inflation rate…And again, they’ve have been wrong…Inflation has not been a problem…and isn’t going to be anytime in the near future. TWO - if the Fed were to push short term rates sharply higher…which also ain’t going to happen ANY time soon. Right now, short term rates are basically at ¼ % all the way out to next summer, and are only very slightly higher all the way to 2015. SOME day, the Fed will, with the perception the economy is at risk of “overheating”, begin to push those rates higher, which, depending on how much higher they push, will begin to impact long term rates. At present, the 30 year Treasury (the long bond), is paying about 3.8% and short term rates, at a quarter percent, therefore offer no competition to that bond if an investor is looking for a debt instrument paying a decent interest rate. IF, however, short term rates were to be raised up to, for example, 2.5 %, MAYBE you would have a situation where investors would think 3.8% was not enough for the 30 year…and the consequence MIGHT be that those long term rates would have to rise to attract buyers, meaning falling bond prices…More simply stated, if short term rates, which are directly controlled by the Fed do go up enough, long term rates will eventually go up as well. And on a related front, and this might be a bit confusing, I actually believe that if the Fed were to begin raising short rates, the immediate reaction by Bonds would actually be to see them rally even more…due to the potentially diminished possibility of inflation spurred by the “vigilance” of the Fed…But taking this idea any farther right now is unnecessary. The Fed has been quite clear. Short rates are NOT going up any time soon…and therefore, I reiterate, in my opinion, neither are long term rates. THREE - The third and final reason for Treasury prices to fall is almost not worth considering, but here it is: If, for some reason, the world decided that US Treasury Bonds were no longer absolutely the SAFEST PIECE OF PAPER ON THIS PLANET, if nobody wanted our debt, then (and this is really an absurd “then”) our bond prices would fall and our long term rates would then go up. However, US Treasuries ARE regarded as the safest paper in the world. This is NOT going to change and even suggesting this as a possibility (even though it was a popular conception a few years back) is, I believe, in the realm of the absurd. 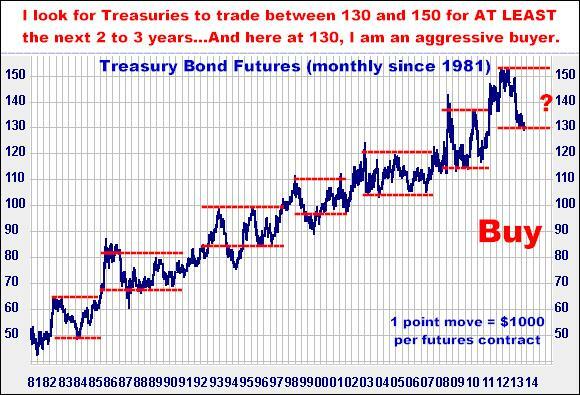 Why then should bonds rally? To start with, fixed income (Treasury Bills, Bonds, CD’s, etc.) is as much a part of this planet as the air we breathe. And specifically, every single day, from every corner of the planet, there are MANY BILLIONS of dollars that are earmarked for the purchase, THAT SAME DAY, of some kind of quality Bond, whether it be Corporate, Municipals, Treasuries, Domestic, Foreign or whatever…This buying comes from Banks, Pension Plans, Insurance Companies, Governments and other institutions that all have some form of a mandate stating they HAVE to invest in certain types of safe paper with the funds they are responsible for preserving and protecting. And while these entities have some discretion as to what they buy, what they can’t do is make a decision like, “I don’t like the yields right now. I’ll wait six months until they get better.” THEY ARE ALL BUYING EVERY DAY AND THE AMOUNTS THEY ARE CUMULATIVELY BUYING MAKES THE ROUGHLY 4 BILLION A DAY THE FED HAS BEEN SPENDING ON QE-3 LOOK LIKE A DROP IN THE BUCKET…Their demand is massive and constant, and while they might all like getting a higher interest rate (Who doesn’t? ), they spend what they are required to spend, every day, no matter what the yield…The point is, one of the incorrect media assumptions out there, that “nobody will buy at these low yields”, is just totally ignorant. There is, literally, a whole WORLD of buying out there, again EVERY day, and it never stops. There are also the demographics of the Baby Boom, which itself has almost become passé as a subject, but still does represent a major force around the globe (the post WWII “boom” didn’t only occur here in the USA). For at least the past 30 years…since the 1980 creation of IRA’s mandated that employees should invest in some piece of paper…this glob of humanity has certainly played a major part in the monster bull market (and economic growth) we have experienced, and now, as they are en masse becoming seniors, I have little doubt there will be a definite shift in their attitudes AWAY from the risks in Stocks and TOWARDS the security of the bond market. And this is not just some 2-3 year event...With everybody living longer, and even earning longer, I am fairly certain this same voluminous boomer buying that has supported equities for decades, will now become ANOTHER ever present source of buying in the interest rate markets for many years to come…And they, like those institutions noted above, will have relatively the same buyer’s attitude, that being, “I need to put this money somewhere other than stocks. All I really want is safety. My primary concern is not the interest rate it will pay me.”. But whoa!...There are, I believe, several other major sources of buying for US Government Securities, but this newsletter definitely already has far too much information…And I can’t believe anybody would still be reading any of this, so I’m going to try to end it quickly, even though I still have a stack of one line notes that could each easily represent another few paragraphs…But this IS enough…So except for a specific recommendation or two, this thing is DONE. 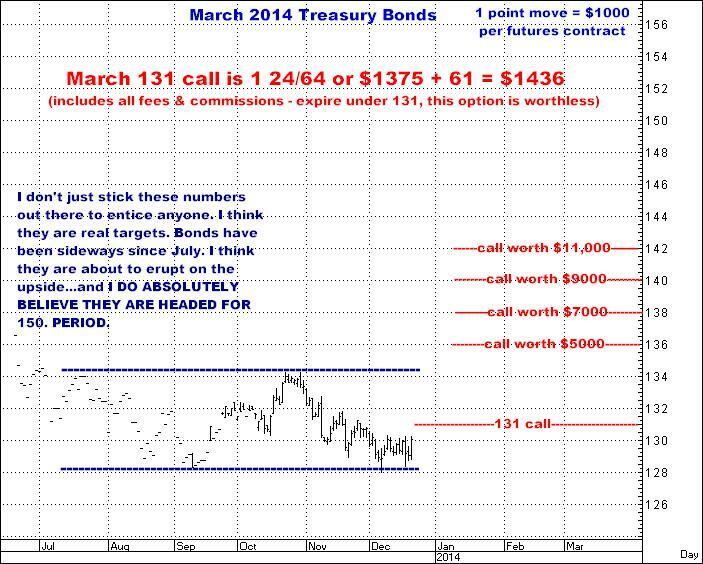 I believe Treasuries will trade between roughly between 130 and 150 for some years to come. Right now, they are at the low end of that range. BUY THEM NOW. LOOK TO OWN THEM FOR 6 MONTHS TO A YEAR. I THINK THE ODDS ARE QUITE STRONG THE BULL MOVE IS NOW EITHER IMMINENT OR ALREADY UNDERWAY. Trace for yourself the way this market has traded the past 30 years…It goes up. It goes down. Note that the recent move down from 152 is about as big a downswing as we normally get (a few are bigger). SURE, this does NOT mean they have to go up now…but look at it this way…If we DO go down from here, this would mean that those 98% of bleating analytic sheep on the planet, who are PERPETUALLY backwards, would be RIGHT, but, come on! They NEVER are…Maybe I’m wrong and we aren’t going back to 150, but I look at the action here and think, “140 sure as hell looks almost easy from here”. 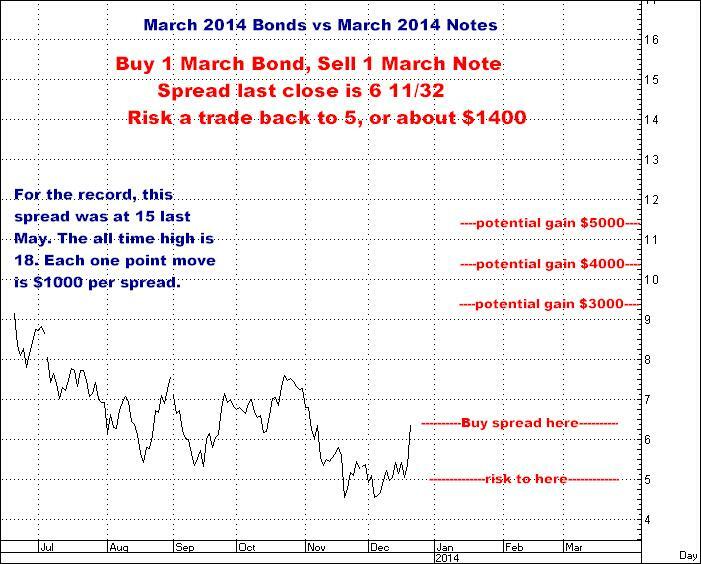 And finally, here is a spread I have used in the past when trading the Treasury Bond market…but this concept is definitely confusing for most people so I am only going to present the chart here with no explanation regarding how spreads work…Those of you who do understand what I’m showing you here are more than welcome to call and ask for more details…Or for that matter, any of you who want to know? Just pick up the phone and ask. ll done. Thank you if you read this whole damn thing. For you guys who have been there with me in Bonds before, you MUST know where I am coming from and know that I am not just throwing this stuff out there. My case is sound. I believe what we really have is just a classic, classic bond bottom that has been setting up since July, and with the Fed’s recent supposedly bearish announcement, I think they are just flat ready to go. So if you do have ANY inclination to follow me, DO give me a call. As you easily know, we have been through some real disasters in Bonds…but we have also been through some INCREDIBLE knock-it-out-of-the-park rides…and I wouldn’t be sitting here on a Saturday if I didn’t think the latter was what we’ll see next. Regards, Merry Christmas and Happy New Year to all of you.